I know it’s not going to surprise you that time is currently my most precious commodity. Balancing work and family means that I’m very protective of the free time we do have. Anything that takes away from me being with BL and Vander needs to be worth it. And, that includes cooking. I casually meal-planned before baby, but I didn’t take it too seriously. I didn’t need to. I worked from home, literally cooked for my job and there was always plenty of ready-to-go meals in the fridge and pre-made ones in the freezer. Since BL worked late most nights, I was a happy short-order cook. If he didn’t like what I had made that day, I’d have no problem whipping something up while he drove home. Of course, some nights we have more energy but this is the reality for at least a few of our weeknights. Therefore, I’ve really started to get into meal prepping. Where as before I didn’t see the need, it’s become our saving grace for continuing to eat healthy and not grabbing take-out again. As an added bonus, meal prepping has also helped us save money on our grocery bills by only buying foods that we actually plan on eating. It also eliminates the extra stress of trying to figure out what’s for lunch/dinner and spending less time in the kitchen overall, which was my initial goal to start with. Since this meal prepping has been such a life-saver for us, I figured you’d want to know about it as well. This complete guide shows you how I meal prep every week, tips for effortless meal prepping and go-to recipes. Every weekend, I set aside some time to get meal prepping done for the week ahead. This usually happens on Sunday evening, but I’ve also been known to get up earlier that day and knock it out if we’ve got a busy day ahead. Sometimes I’ll even use a few hours on Monday morning to finish up. Remember, the goal is to spend less time in the kitchen, so put away as many distractions as possible and use your time efficiently. For me this means that BL handles Vander so I can be speedy. This list changes week to week, but the concepts don’t. We love soup and this is a great way to batch cook, even in the summer time. This time of year, I usually make two soups to get us through the week: one hearty, like chili, and one broth based, like a vegetable kale soup. Not only does soup make for easy lunches, but it’s also a great start for a dinner. I like to pair soup with a small salad or a grilled cheese, depending on how hungry we are that evening. If I’ve accidentally made too much or we are tired of the same bowl of soup, then I simply freeze whatever we have left to pull out in a few weeks time. I know that cutting vegetables doesn’t take a long time, but it’s honestly the last thing I want to do when I am exhausted. There have been many nights I’ve decided against a salad all-together because the idea of chopping up vegetables seemed too daunting. I am a sleep zombie most of the day and this is my truth. Therefore, I prep what I can ahead of time. That means slicing up bell peppers and celery sticks and putting them in water and prepping my greens. For leafy items like kale and romaine, I wash and dry the leaves very well, then place them on paper towel and roll them up and put in a plastic bag. I made a full video of this for PBH a few years ago and it’s my trick for keeping greens fresh for ~1 week. If I don’t do a full pan of roasted vegetables on Sunday, I’ll roast whatever cut up vegetables I have leftover on Thursday. Nothing goes to waste! I’m also a big fan of pre-cut vegetables at the store. Yes, I know they are more expensive. Stupid expensive. But, they also ensure that I eat my veggies at dinner without any fuss, which feels worth it to me. I don’t always buy them prepped, but I find myself doing this more and more often to cut down on prep time. While I’d be just as happy eating leftovers for breakfast, BL prefers standard fare. To make breakfast one last thing we have to think about, I’ve been stocking our freezer with smoothie packs and freezer waffles. I don’t do this every week, but I will often make a batch of baked oatmeal or overnight oats to have on hand as well. More ideas on this below! This is one that I do most weeks, but not every week depending on time. I’m not a big snacker in general, but I like having options on hand when I don’t have time to grab anything else and to send with BL’s lunch. I also know that in a few months, Van will be snacking along with us and it’s good practice for me to keep these options going. Since nuts are my favorite thing to snack on, I prefer no-bake balls or energy bars for quick, healthy options. Just like with soups, whatever I don’t eat during the week gets frozen for the future. This has become the equivalent of soup for me as a clean-out-the-fridge idea. I’ll cook whatever grain we have on hand (freekah, farro, brown rice, quinoa, ect.) and then add in some roasted vegetables, nuts, maybe a cheese and a dressing. It usually will keep for a few days in the fridge- recipe ideas below! Sometimes I just make a big batch of grains instead of a specific grain salad. 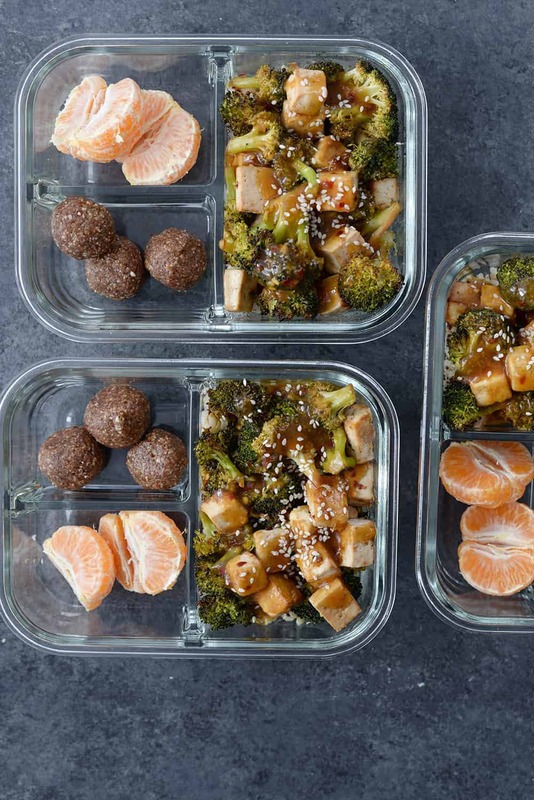 I did this for the meal prep containers shown here and it’s a nice option for simple buddha bowls throughout the week. Start with cooked grain, layer on whatever vegetables you like, add your protein and drizzle on a dressing. Delicious, easy and healthy. Lastly, I prep some kind of protein. For our mostly plant-based family, this is usually some type of tofu, beans and tempeh. I’ve included options on all of these below, but it can be a batch of my tofu scramble, baked tofu, tempeh sausage crumbles or chickpea salad for sandwiches. This way, no matter what I’m making for dinner, I don’t have to prep this ahead of time. Feeling pasta? I’ll throw some of my cut vegetables and tempeh sausage into a sauce and boil some noodles. Fancy a bowl? I’ll start with my grain salad, add some protein and maybe a bit of avocado and a dressing. The point is that meal prep should make things easy for you to grab and go throughout the week. Think about what foods you make MOST often and then find a way to batch prep them on the weekend. I find for most of my clients; a big batch of ready-to-go protein, roasted vegetables, a grain salad, greens and a breakfast/snack option is a huge time saver. 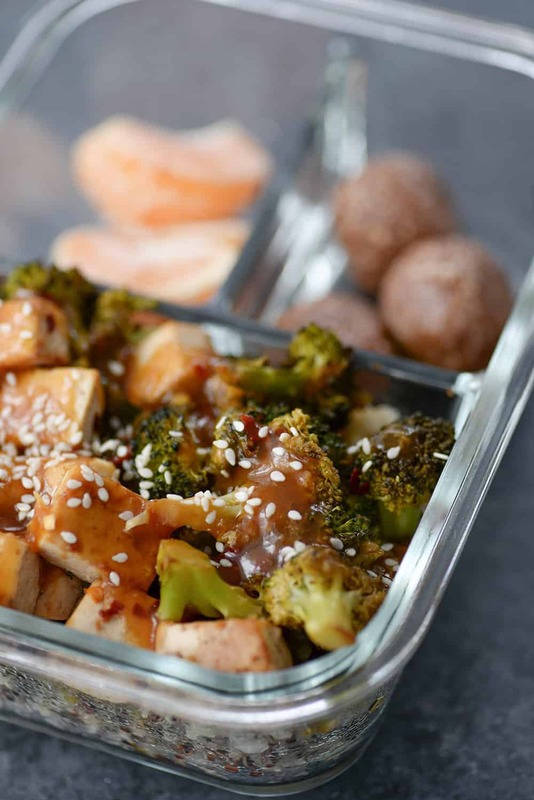 I included the recipe for this Sheet Pan Tofu and Broccoli below and it’s a become my new favorite lunch option. I’ve started working at a co-working space a few days a week and packing my lunches to-go was a struggle at first. Now, I layer in a cooked grain, a meal like this and a snack and I’m done for the entire week! I’ve got lunch taken care of Monday-Thursday, with the option to go out on Friday or take leftovers. I use these meal prep containers and I love how easy they make portioning out my meals. If I’m feeling extra ambitious, I’ll make two meals for lunches that week and divide it into 4: two lunches for BL and I on Monday and Tuesday and two lunches for us again on Wednesday and Thursday. Easy Plant-Based Meal Planning! A complete guide on how to vegetarian meal-prep to save time and money. Whisk together 1/4 cup soy sauce, rice wine vinegar, 1 tablespoon toasted sesame oil, 1 minced garlic clove, fresh ginger, red pepper flakes, vegetable broth and cornstarch until smooth and set aside. Press the tofu to remove as much water as possible. You can do this using a tofu press or by wrapping it in paper towels and placing a heavy object on top for 10-15 minutes. 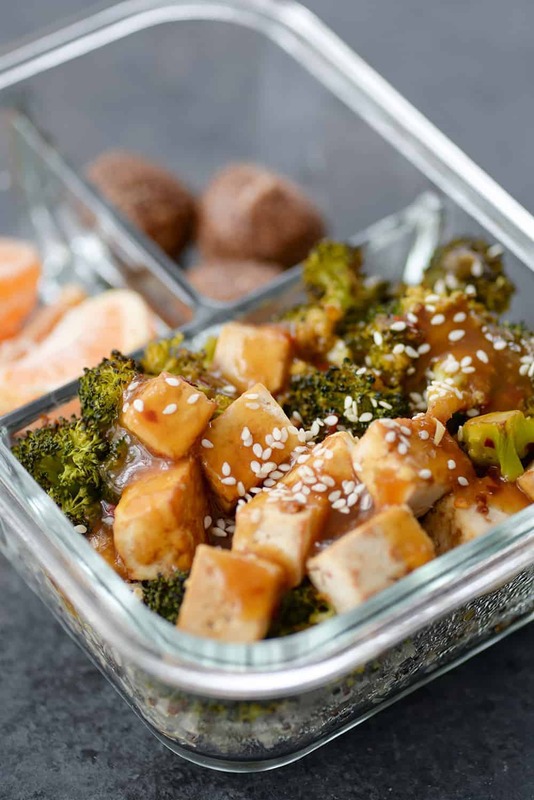 Toss the broccoli and tofu with the remaining soy sauce, sesame oil, olive oil, minced garlic clove and pinch salt and freshly ground pepper. 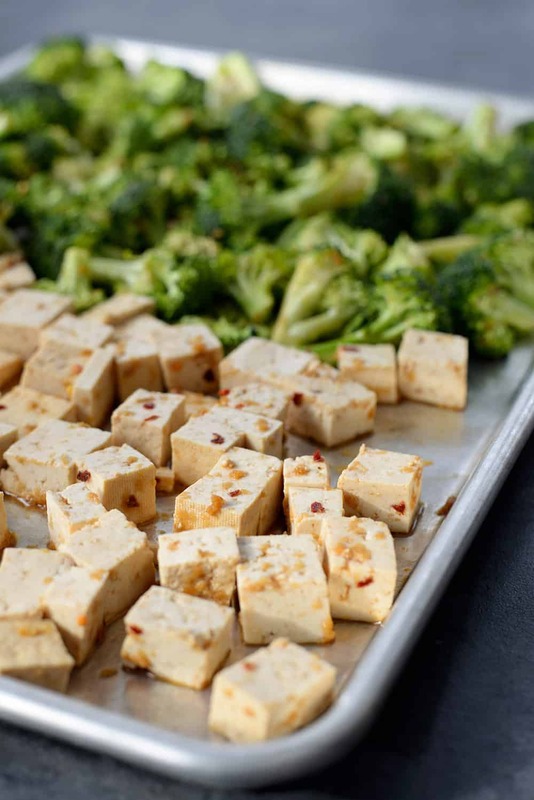 Place in a single layer on a baking sheet and roast until broccoli is tender and tofu is crispy, about 20-25 minutes. While the tofu cooks, place the soy sauce mixture in a small saucepan over medium heat. Stir until thickened, about 5-10 minutes. Divide the brown rice among 4 bowls (or meal plan containers, I use these) and top with the tofu and broccoli. Spoon the sauce on top and garnish with sesame seeds, if desired. 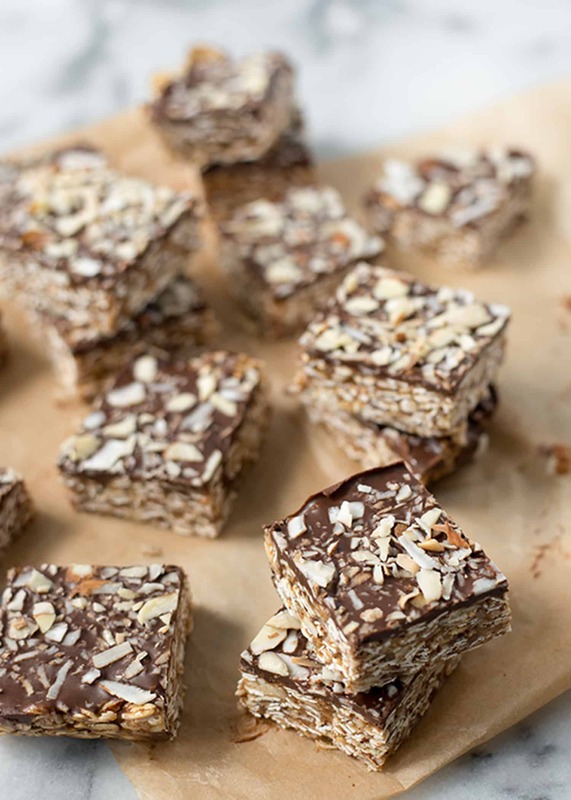 I serve these with fruit and my no-bake nutella energy bites. So, now that you get a sense of how I meal prep each week, these are my go-to recipe options. 3. Cranberry Breakfast Parfaits: layers of cranberry sauce, yogurt and granola. Save the granola for topping right before eating. 4. 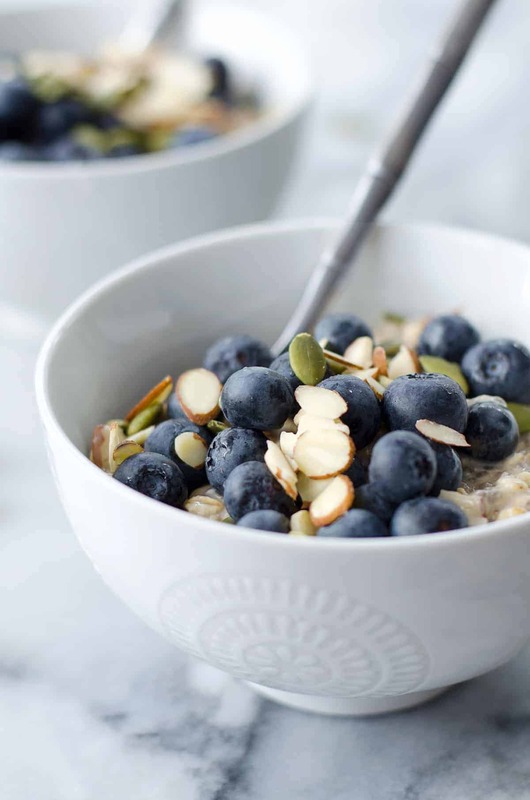 Blueberry Muesli: This is my favorite breakfast in the summer. Super cooling and delicious. 5. Blood Orange Parfaits: Another parfait featuring blood orange chia jam, but any fruit juice will work. 6. Tofu Scramble: the best part about tofu scramble is that you can reheat it over and over again, unlike eggs. I make a batch every few weeks for easy breakfasts. I love tofu scramble in a wrap with roasted vegetables! Makes for a yummy breakfast or lunch. 7. Baked Oatmeal: how many times have I said the word favorite? Because, this breakfast is another one. Baked oatmeal is so delicious and something I crave much more often than overnight oats in the winter. I love it warm topped with almond milk and whatever fruit I’ve got lying around. 1. Lentil Nicoise Salad: prep the beans, lentils, dressing and potatoes ahead of time, then assemble right before ready to eat and add the olives and the tomatoes. 3. Mediterranean Yogurt Bowl: make the couscous, dressing and chickpeas ahead of time. Assemble with cucumbers and other fresh vegetables right before serving. 4. Harissa Tahini Tofu Bowls: make the tofu, potatoes and vegetables ahead of time. Warm everything up and drizzle with the dressing right before eating. 5. Burrito Bowl Mason Jar Salads: Make ahead of time for easy lunches throughout the week! 6. Peanut Tofu Buddha Bowl: Bake the tofu, but don’t add the sauce yet. Make the brown rice and chickpeas ahead of time. To warm together, saute the tofu and the chickpeas with the sauce and heat the brown rice. Add in the fresh spinach and carrots and eat! 8. 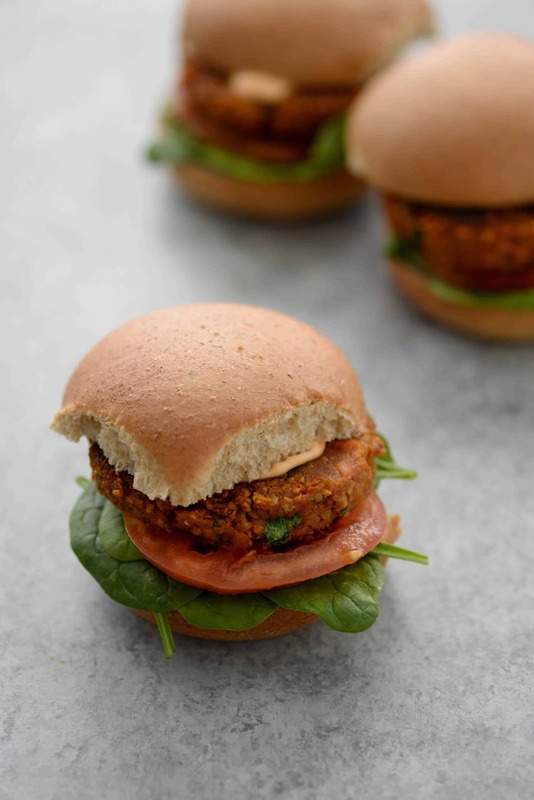 Black Bean and Sweet Potato Burgers: Make the patties ahead of time for simple burger assembly for dinner or, crumble the patties and use to top salads. 9. Roasted Vegetable Pitas: Make the romesco sauce and vegetables ahead of time. Warm the vegetables and sauce, then spread on fresh pita. 10. Green Goddess Veggie Sandwiches: I prep all the vegetables except for the sliced tomatoes ahead of time. Make the dressing ahead of time, then assemble. This is my go-to dinner sandwich in the summertime! 12. Buffalo Chickpea Lettuce Wraps: Make the chickpeas ahead of time along with the dressing. Before eating, warm the chickpeas and assemble the wraps! 13. Chickpea Salad Sandwich: Make the chickpea salad ahead of time for easy lunches. This is one of my favorite meal prep lunch options! 14. Lentil Sloppy Joes: Another favorite dinner prep idea. I make a batch of these lentil sloppy joes roughly once a month- BL loves them! 15. Crispy Baked Tofu: Make a batch of these, then flavor with sauces as needed depending on what meal you are pairing them with. 17. Lentil Tacos! Another staple in our house. We love these in tortillas, in lettuce wraps or in taco salads. 18. Taco Stuffed Sweet Potatoes: Make the black bean filling ahead of time. Then, cook sweet potatoes before and fill or microwave the potatoes and fill. 19. Cup o’ Curry Noodles: These are another great lunch option! Just fill with hot water, shake and serve. 20. BBQ Tempeh Bowl: Make the tempeh, roast the vegetables, cook the rice and store separately. When ready to eat, heat, combine and eat! 21. Red Beans and Rice: This meal is so stick-to-your-ribs delicious, I warm mine up with a little hot sauce. 1. 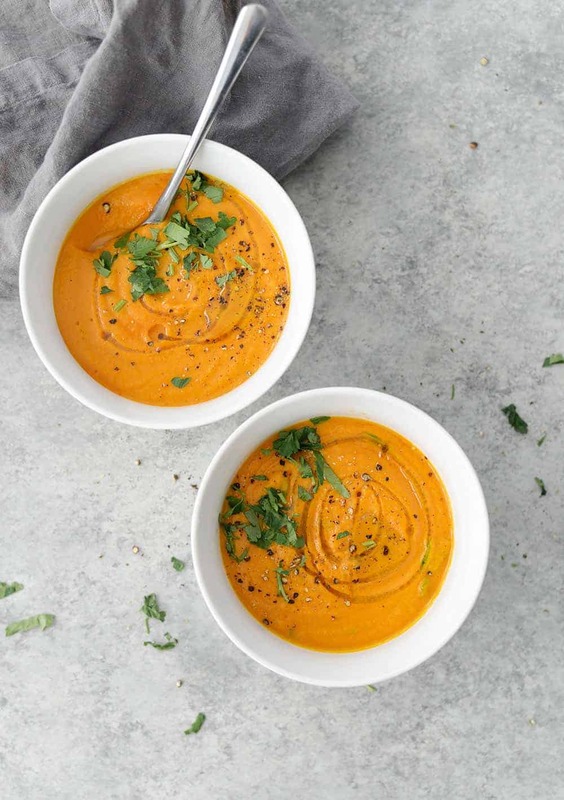 Immune Boosting Carrot Ginger Soup: this is my most recent soup that I’ve made and I love how creamy and smooth it is. 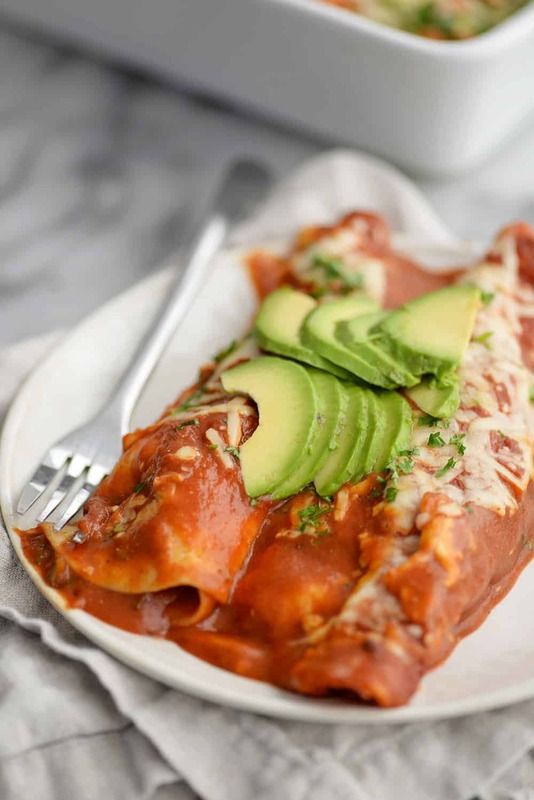 It’s also ready in just 15 minutes, so can be made ahead or right away. 2. Moroccan Lentil Soup: this soup makes a ton! Whenever I make it, I freeze half right away so I know I’ve got dinner a few weeks away. 3. Pea and Asparagus Soup: another creamy soup that’s perfect for making ahead! 4. Tempeh Chili: I LOVE this chili, it’s so meaty and packed with protein. It freezes well. 5. Vegan Vegetable Potato Chowder: another great freezable meal. 9. Chickpea Lemon Orzo Soup: make this ahead of time and then cook the orzo right before serving. 10. Weeknight Tortilla Soup: Make this and then top with herbs and tortilla strips right before serving. Great post! I made the sheet pan tofu & broccoli for dinner tonight, along with roasted glazed carrots, and it was really good and came together very fast. My husband loved the sauce. One thing—the recipe says to add only 1/4 cup soy sauce to the sauce mixture, but I couldn’t find where it says what to do with the rest of the 1/3 cup. I assume it goes with the tofu & broccoli before roasting, so that’s what I did. Thanks for all of the great ideas for meal prep. I always plan two weeks of dinners at a time and do the prep for those in the morning/afternoon, but I’m not so good at planning lunches. I like the idea of preparing a bunch of basic foods one day and having them in the fridge to throw together for lunch. I plan on trying that this week, thanks for the good idea! Thanks Parie! Yes, sorry- just made the change now. You add the rest of the soy sauce with the tofu and broccoli before roasting. I love this post! Can’t wait to try some new recipes! A sleep consultant! I think my baby is a better than average sleeper and I have thought about it! Since she was six weeks she has been decent…at best she sleeps 12 hours and at worst she will wake up twice. Every night is different. However, she usually only takes short naps like 20-40 min. So maybe that is why she sleeps well?! Anyways my tips are we co-sleep with a dock a tot, sleep with a box fan for white noise every single night, dark dark room, and once 5:00pm hits we turn down all the lights in the house signaling it is bed time. For naps I don’t make it dark just trying to signify that it is still day time. Idk if any of that is legit though! Good luck and if you come across anything helpful lmk! !